Taxpayers spend about $7 billion per year to help pay workers who are employed by an industry that rakes in $200 billion annually. That's because the fast food industry's notoriously low wages force more than half of fast food workers to rely on some form of government assistance like food stamps or Medicaid to get by, a study from the University of California-Berkeley and the University of Illinois at Urbana-Champaign recently found. These findings reflect the bleak reality of the low-wage recovery. Nearly 70 percent of the new jobs created since the end of the recession have been in low-wage sectors like fast food and retail and they’ve replaced largely middle-income jobs. Representatives from the fast food industry say the sector is creating millions of jobs that pay competitive wages. 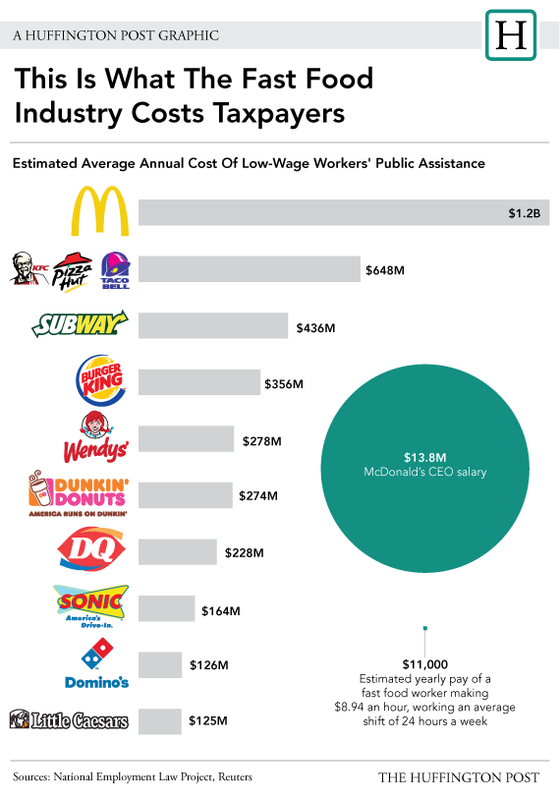 As representatives from Burger King and Dunkin’ Donuts note, many of the chains are largely run by franchisees. Often they operate on slim profit margins, making a wage boost difficult. In a statement made earlier this week, McDonald’s emphasized that the company and its franchisees provide vast numbers of entry level jobs with opportunities for advancement. The National Restaurant Association, an industry trade group, wrote in a statement that given these factors and others, the Berkeley/UI data and NELP analysis were "misleading." “(The studies) fail to recognize that the majority of lower-wage employees works part-time to supplement a family income,” Scott DeFife, the restaurant association’s executive vice president of policy and government affairs, wrote in an emailed statement.